You are here: Home / Finished Projects / Spring is here!! I was going to say summer, as officially we are now on British Summer Time however… when you live here in the UK it is a little optimistic or perhaps a little foolish to proclaim summer has officially started at the beginning of April! Case in point, my mother’s birthday is on the 21st April and when she was born, the country was in the grip of a particularly severe winter. But the daffodils are out, the days are getting longer and I am really hoping that we will have some lovely summer days this year! And in the spirit of spring and eternal optimism, I am not going to dwell on the failures of my Beignet skirt….much. To recap – I tried and failed to make this last year. What have I learned since then? – don’t use awful fabric and for goodness sake, cut it properly! 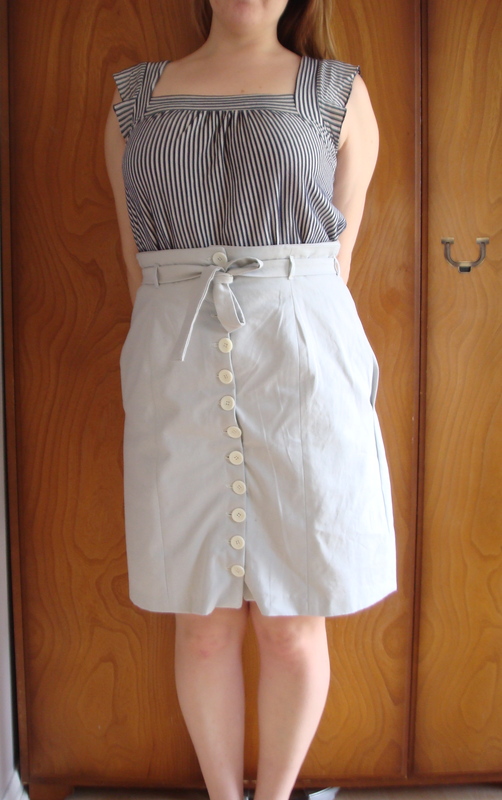 The fabric for this skirt is from Fabrics Galore in London, and it’s a very pale medium weight blue-grey cotton drill and the lining is a white silk cotton mix. For the first time ever I serged/overlocked the edges of the fabric before sewing the seams – don’t ask me why I haven’t done this before! And since I took a bit more care and attention on the cutting out of the pattern, it actually went together pretty easily. So the construction wasn’t too bad…. Well, the trouble really, is the fit. I didn’t do a muslin. And I used the size I traced out two years ago, which I didn’t write down. Hmm, but since my weight has fluctuated since then, I thought it would come up small. Instead, I must have traced out the larger pattern. I feel a bit of a frumpster in this to be honest. It’s too big, so I will have to see if I can shrink it. But I am determined to wear it at least, even though i’m not 100% keen on it because I made it, and pride or sheer bl**dy mindedness makes me wear it!! Oh how frustrating to take the time to do a careful construction job and then get the fit wrong! Still, too big is less upsetting than too small. I feel even worse when things are too tight. I know, it’s such a pain – but I think I will just chalk this one up to experience, I know I must learn to to get better at doing muslins and doing fittings!